The group started the capital amount from $300 and within two years they have received back more than $500. 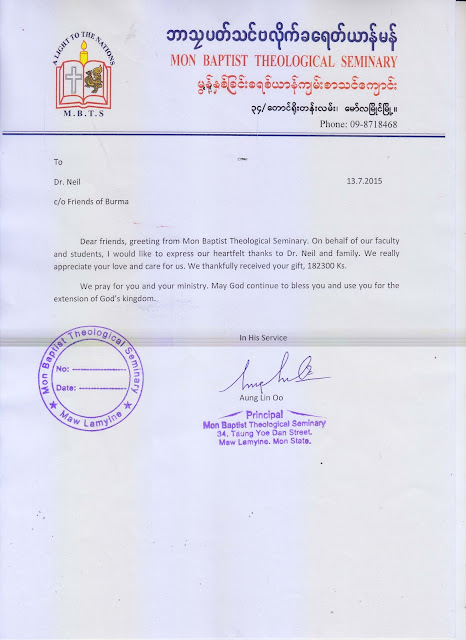 They contributed $45 to Yangon Kayin Baptist Women Association for Endowment Fund. They also contributed some amount to their zone’s women leadership training. The women group has a plan to rotate the revolving fund within their 3 zones. 1. My name is Naw Helen Htoo. I have one sister and she is a school teacher. We both are single women. We still have both parents who are in old age. To take care of my parents, I choose to work at my house while my sister is teaching at school. 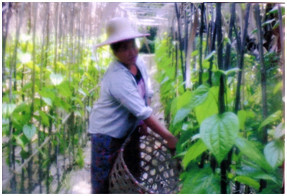 I took loan from my micro finance group and with my own money, I did betel leaves plantation nearby my house. As our culture, we can use betel leaves for herbal medicine and especially my required market is those who eat betel quid every day. When the leaves grow mature enough to eat, we pick the leaves twice in a month. We can sell it during four months, and we get 2500 kyats for one viss. Approximately we receive net profit 400,000 Ks ($400) per season. We thank FOB for given us financial resources to organize micro finance group to get loan in reasonable rate. Now I can support my parents not only by my strength but also by financial support. As my sister has income as a teacher, I also get income even while staying at my home. This experience makes me to have more confidence in my life as a single woman headed household. 2. 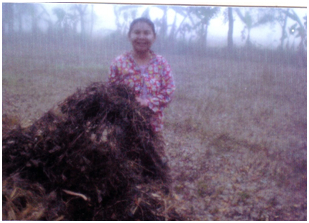 I am Naw Ee and I live with my widowed mother who is 80 years old. I work as a teacher at a village school which is far from my house. My mother is getting weak in physical and when I go to school she is alone at home. So I have decided to resign from my work to take care of my mother at home. I also serve the Church as a women group secretary when we started to form a group, I was the one who participated in this group as one of the leaders at the group. I also have a sister called Naw Eh Htoo who is my coworker for our own business. 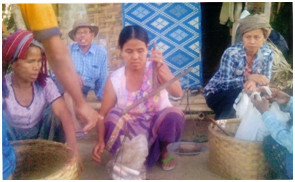 We took loan from the micro finance group, opened a shop and sold dry fishes, fish paste and betel quid. Our daily income has covered our expenses and even we could save some amount from the profit. Now we could give back our partial amount of the loan as the process in the group. 3. My Name is Naw Paw Bway Htoo and I have 3 children. My husband has suffered TB disease for many years and could not do heavy work. 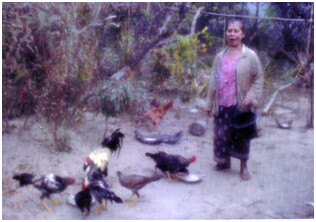 When the group of micro finance was organized I became a group member and as the process of our group I took loan from the group and I raise the native chicken at home. My husband and children could help me in raising the chicken. I got income from working in paddy field but raising chicken at home also support the needs of my family. 4. My name is Naw Thay Thwe and my husband became disabled when he was working in someone’s paddy field as a daily laborer and now his left leg does not has enough strength to work in the paddy field. I have 6 children and it is very difficult to get income to cover the expenses for my family. So now I myself and my 2 elder kids are working at paddy field and also bean plantation. We took loan for bean plantation from the group. After harvest time we could give back our loan as the process of back payment of loan. Because of loan service charges is reasonable, it covers the expenses for plantation and making gain benefit from bean plantation. We really thank FOB for providing this program to get the survived income for my family.